Successfully Added Cubot X6 Android 4.4 Phone - 5 Inch 1280x720 Capacitive IPS OGS Screen, Octa-Core 1.7GHz CPU, 16GB Internal Memory (Black) to your Shopping Cart. Cubot X6 Octa-Core Android 4.2 Phone boasts an MTK6592 1.7GHz CPU as well as a 5 Inch 1280x720 Capacitive IPS OGS Screen, 1GB RAM, 16GB ROM, 8MP Rear Camera and a 5MP Front Camera, it has been designed to truly interpret why the MTK6592 is better than previous generations of MTK chipsets. The Cubot X6 cell phone is an alternate octa core beast that uses the MTK6592 processor to provide for a quicker and stronger performance than its rivals. In addition this chipset is superior to past models of MTK chipsets, which brings about smoother operation and speedier gaming. The processor is a 1.7GHz octa center CPU plus the Cubot X6 has 1GB of RAM, so that there is no reason for slacking or slowness in its performance. Coming with a pure stock version of Android's 4.4 Kitkat operating system pre-installed as well as Google Play you can instantly start downloading apps and make the Cubot X6 your own. With Android as well as Google Play, you can customize lay-outs in addition to the ability to download applications directly. With 16GB of internal memory, which can be easily expanded via the built-in micro SD card slot there is plent of room for saving all the downloaded applications as well as music and video files on the Cubot X6 octa-core phone. The Cubot X6 fits precisely in the palm of your hand or conveniently into your trouser pocket or purse as it has a 5 inch display. You can navigate easily through the menus and have full control for zooming in on content and interacting with games like Fruit Ninja, Angry Birds and more with a 5 point multiple touch capacitive display. Quality of the screen is consistent from any angle so that it comforts the eyes with mild contrast due to the Cubot X6 features a 1280x720 resolution as well implemented with IPS and OGS technology. 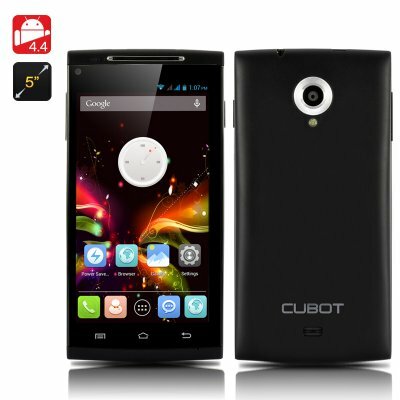 There are two cameras incorporated on this Cubot smartphone with one being a 5 megapixel camera positioned at the front; therefore you can take self-portrait photos in addition to using it for online web conversations. Also there is an 8 megapixel camera that can be interpolated up to 13 megapixels on the rear of the phone for capturing other moments. The Cubot handset is faster than most of its competition with the MTK6592 processor, this Android mobile phone deals with the 900 thousand pixels (1280x720) each time perfectly.